The Admin Bar appears at the top right of the KDManage screen. This section introduces the Administrative Settings menu . Generally the items of this menu relate to, or have an effect on, multiple KDDart elements such as Experiments, Germplasm, Markers or Inventory. 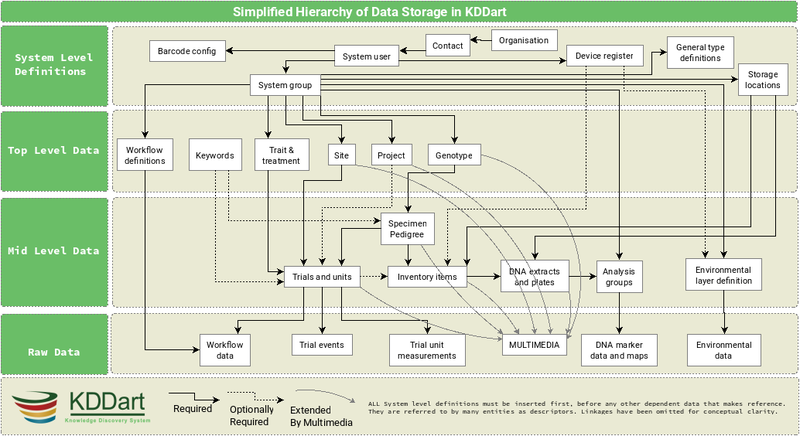 Data relationships within KDDart are hierarchical, hence data needs to be populated in a specific order to ensure it is available when needed to create other, ‘related’ elements. The Organisation Name defines an entity which may be an external or internal collaborating organisation. The text of the Organisation Name is easily updated after it has been entered. Defines contacts for an organisation which may include KDDart system users, collaborators, material providers, etc. Contacts within KDDart refer to those people who have a relevant role or responsibility in relationship to the data. For example a Site Manager needs to be entered as a Contact as they are required to be referenced when defining a Site, however they may not necessarily be a user who logs in to the KDDart system. Prerequisite: The Organisation Name must already exist before Contacts can be added. The following image illustrates the fields for Contacts. All fields except ‘Contact Location’ are mandatory. The map view, not illustrated, appears below the form and enables the selection of the contact’s geographic location. Types are used as part of KDDart’s global vocabulary to support classification. 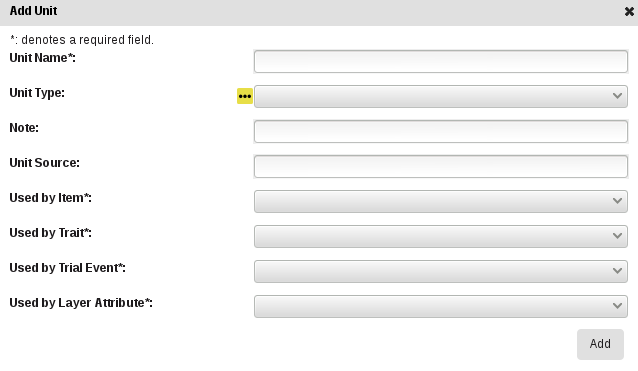 The following image of the Add Type form shows the fields required for adding a new Type. The Is Active field allows a Type to be enabled or disabled as required. Setting a Type to Inactive removes the item from future selection lists, however the classification remains historically present for those records still referencing it. Devices with a role to play, such as measuring or capturing information, e.g. weather instruments, scales, soil monitors, etc. need to be registered in KDDart. Device registration can assist with record keeping and accountability. This can later assist identifying and if necessary isolating the information or data that a specific instrument produced or assisted in producing. For example, if a device was discovered to be needing recalibration, or providing questionable results it’s data can be isolated, either to ignore during analysis or to apply specific adjustment. Devices belong to the Class: Device Register Devices are classified with a Device Type of Device Register Class and optionally may have a specific geographic location recorded. Barcode configuration can be created to define how barcodes are created for various applications. Project entities can be created which are designed to help with progress and file tracking for various projects your organisation may be undertaking. Project types care created via the Type page. Units enable the custom definition of the units of measurement for Items, Traits and Trial Events. Unit types are created via the Type page or can also be accessed via the quick link button without leaving the Add Unit window. Users need to be assign to appropriate groups to provide them with their required level of access. Once a group is created, exisiting users can be added to the group and if needed, made an Administrator of that group. 1 From the Administrative Settings menu select Groups. Select the Add Group button, to display the Add Group window as illustrated next. At the required Group Name select the Add button, to display the Add User to Group window. 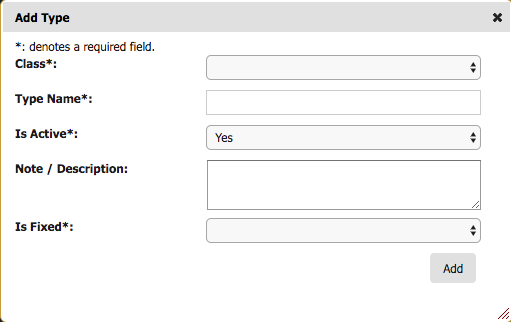 3 Enter the required fields then select the Add button. 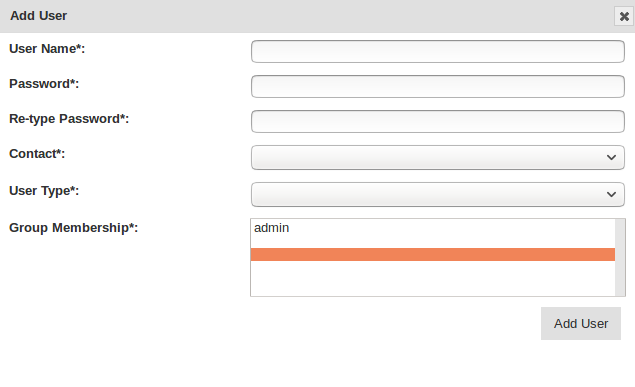 An Administrator group user is able to create new users and assign them to the appropriate groups for their required access. 1 From the Administrative Settings menu select Users. 2 Select the Add User button, to display the Add User window as illustrated next. Note: The Contact, User Type, Group must already exist. Refer to the Contacts page to create Contact, the Type page to create User Types and the Groups page to create Groups if not already existing. 4 Select the Add button to create the new user. 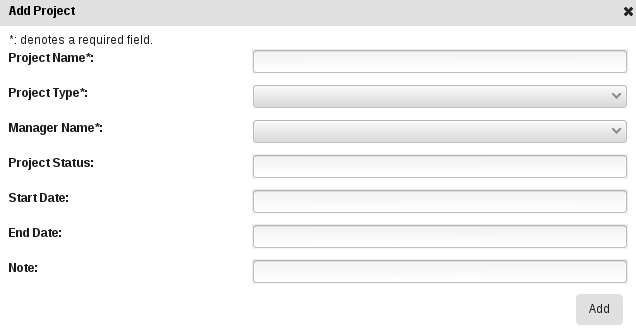 5 Proceed to Administrative Settings menu select Groups to assign the new user to appropriate Groups. 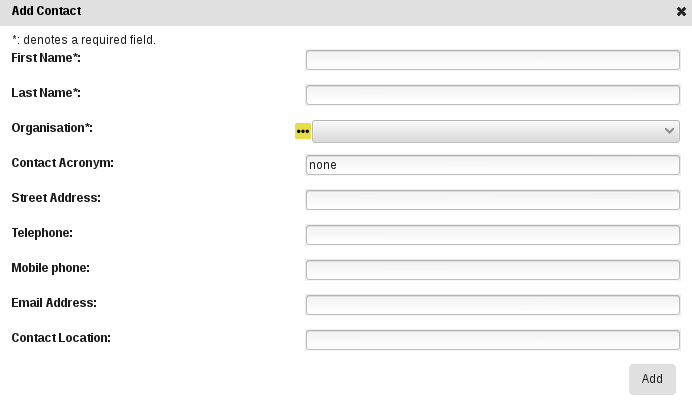 Factors are custom fields that Administrators can add to different entities. For example: an extra field for Trials can be added for organisation specific information requirements. Note: Whilst an Administrator can create new Factors it is recommended that Factors are used sparingly are carefull consideration of the very rich KDDart schema. 1 Select the Administrative Settings menu button at top right then select Factor from the dropdown list. 3 Fill in the mandatory fields. Once a Factor is successfully created, a new field will appear in the appropriate entity Add/Update windows. Keywords can be attached to Trial Units and Specimens to assist grouping related entities together. After a Keyword is created, it can be attached to Trial Units. See: Add Keyword to a Trial Unit. When Keywords exist in KDDart they can be organised into Keyword Groups. A Keyword can exist in multiple Keyword Groups if required. The following example show the Add Keyword Group window. 2 Select the Keywords to be included or added to the group. 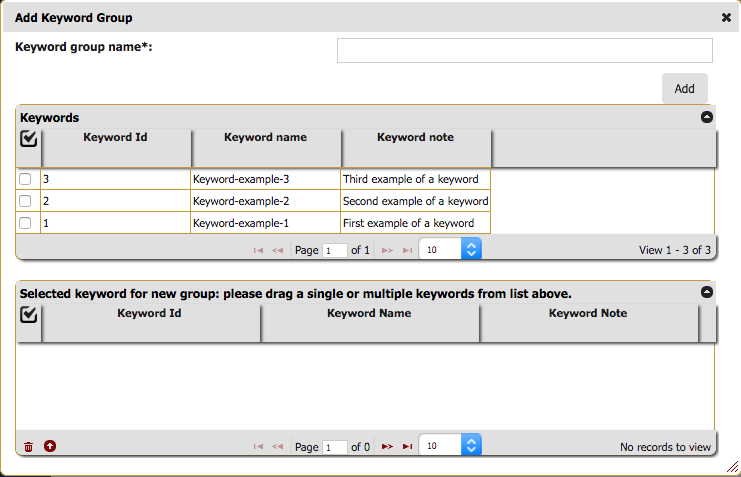 3 Drag the selected Keywords to add to the Keyword Group into the lower group window group. 4 Select the Add button. At conclusion of a trial or nursery a historical reference of activities undertaken is maintained. Facilitates organisations developing their own applications, using the DAL API, to meet specific business requirements e.g. to move towards more automation, or email warnings and alerts of upcoming or overdue tasks. A Workflow Type provides a means to group workflows for different purposes. These maybe to associate workflows for Trials vs Nurseries, different crops, etc. 1 Select the Administrative Settings menu button at top right then select Type from the dropdown list. At Class, select Workflow type. 4 Complete the mandatory fields. 5 Select the Add button to create the new Workflow Type. 1 Select the Administrative Settings menu button at top right then select Workflow from the dropdown list. 2 Select the Add Workflow button. 3 Complete the required details, selecting a Workflow Type, then select the Add button to create the Workflow entity. 3 The new Workflow entity will now appear in the list of Workflows. Workflow Definitions, essentially the Workflow Steps, can now be created or updated or listed if already existing. This helps define what steps are needed in a specific workflow. 1 Select the Administrative Settings menu button at top right then select Workflow from the dropdown list to display the list of Workflows. 2 To add a new definition, on the row of the required Workflow, select the Add button . This will display the Add Step to ‘Workflow id’ button. 3 Enter the Step Name, Step Order and optional Step Note, then select the Add button. 4 Repeat as Step 3 as required. 5 Close the Add Step to ‘Workflow id’ window. Note: Step order must be numerical. This defines what order this definition is in the workflow (i.e. Users must do step 1 before step 2). At the Trial page, a workflow can be added to an existing trial or a new trial created with a workflow. Note: the workflow to be added has already been defined. 1 From the main menu select Experiments then Trials to display the list of Trials. 2 At the required Trial select the Edit button in the Actions column to display the Update Trial window. 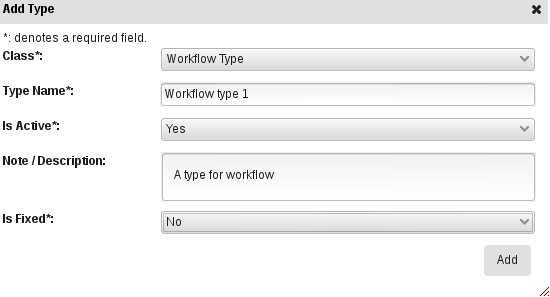 3 At the Current Workflow field select a Workflow from the drop down list then select the Update button. Note: - This selection may also be completed when creating a new trial. - The Workflow choices in the drop down list are populated at the topic 2.Create Workflow above. 4 After the Workflow has been assigned to the Trial, the Add Workflow Step button and List Workflow Steps button will be visible. Click on the Add Workflow Step Button and fill in the mandatory detailes. Note: the Step Id is the Id shown in the Workflow Definition table, not the step number of the Workflow Definition. 5 After a Workflow Step has been added to a Trial, users may click the tick button to mark the step as completed or the cross button to mark the step as incomplete. © Copyright 2018, Diversity Arrays Technology P/L. Last updated on 07 Sep, 2018.